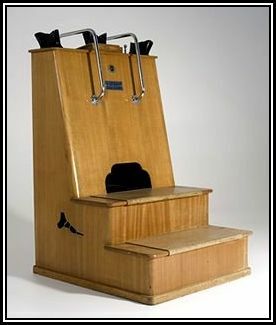 If you are old enough, you will remember going to the shoe store (where we used to have to buy shoes) and climbing up the steps on this machine to get a possibly lethal dose of - RADIATION? These shoe fitting fluoroscope machines were actually built in the early 1900's, but they became commonplace after the war in the forties. Every shoe store had one. It was fun to see the X-rays of your foot bones and the more times you did it the more radiation you received. So, if you were a little brat like me, you kept climbing up on it. It became known that people were being given extreme radiation exposure; the doses had large variations between the machines. Bone cancers and genetic effects were being logged and by 1953, the US FDA banned them, but some were still in use as late as 1970. A college physics professor of mine told me if I had used one, I should be monitored for cancer. I saw a restoration show in 2012 and they tested one of these machines for radiation before they started to tear it down. The meter reading was off the charts. Just thought you might like to know this little factoid. I've never seen or heard of this..interesting.. I really am not well versed in politics..especially outside of my country so I can't say anything either..but it seems to be creating great dissention. Jamie Oliver on Instagram..showed a pie..w/ I'm In written on it..and some pretty strong remarks ensued..it's almost 50/50 so you are bound to hear from both sides...the pros and cons. Well, Monique, you are just a youngster then if you don't remember these machines. They were all over Europe too, and I think Switzerland was the first to ban them. I know very little about the Brexit situation, but it must be like the issues that are coming up in our presidential election, immigration, trade and everything under the sun. Isolationist even? I don't know, but I don't like seeing the stock market today. I think this will be in the history lessons one day. The shoe shops used those on my feet every time I went for new shoes when I was growing up in England! I've had cancer, and survived over 25 years since diagnosed and treated, who knows the causes - life is a total mystery! Scary post Donna - but then what isn't these days! I am glad to know someone remembers them. I hopped onto them every time I went to buy new saddle oxfords. The government quietly began removing them from the stores and I wonder what they did with them. They took the radiation device out of it to test it on the show and it was a fairly small unit, but multiply by thousands and I hope they aren't in my backyard. OGMYGOSH so it really did have a lot of radiation in it? wow I can barley remember seeing one of those once when I was real young. I don't think I got new shoes very often back in the 1950's. Janice, I read about them after my physics professor talked about them and the doses were extremely high. When it came to light, they started telling the stores not to let children on them, then banned them altogether. Science can be bad sometimes. My neighbor, in his 70's, said they used radiation on kids with tonsillitis and sinus problems when he was young as it was the latest thing, and 99% of all the children ended up with thyroid cancer, which he is still battling the effects of today. I don't think we had them. It is scary the way we jumped (and continue to jump) on all the new band waggons isn't it? Brexit scares me a little. I guess all we can do is wait and see. And hope. I like your attitude Child. It looks and sounds familiar but I can't remember. Maybe it is the radiation that is affecting my memory. God, I must be older than Methusula and it might be all that mercury we played with. Amazing - when I think of the times I stepped on it! Oh Pat, I'm glad you remember it. I usually find no one remembers them. I loved those machines when I was a kid, and always insisted that I have another peep at the bones in my feet if ever we were anywhere near one. At the moment, my feet are still attached to the end of my legs. Seems most of us bloggers did make it even though the amounts were off the meter chart. It was interesting to see the bones. Perhaps we were on the machines that didn't give the deadly doses. Oh my I had not heard of these machines before...kinda scary because they definitely do not sound healthy! From your picture I can see you're a mere babe so you wouldn't remember them. Hope your weekend is great too. Donna, I applauded and cheered for Brexit. Most of Britain wanted independence from a huge,faceless Bureaucracy in Brussels. The markets will settle down, and Great Britain, will be a success.... why wouldn't it be, the country has around for over 1000 years and only in the EU for 40 yrs. I think much of Europe will follow suit. I remember the old shoe stores; the little socks you had to put on and the saleswoman would measure your foot with one of those metal contraptions. I really hated going to the shoe store as a kid! I am glad to say, I never saw one of those machines before! Et tu Jeri? A mere babe if you don't remember them. You know more than I do about Brexit. I think you are right about other countries following suit. Like you, I think it will all settle and fall into place. The UK is great. I wonder what the Queen wanted? I guess they had had enough. I kept thinking about Janis Joplin singing, "freedom's just another word for nothing left to lose". Donna, I was born in 53, so maybe the stores had them, but I didn't notice because I was dreading the "shoe lady". The Queen wanted Brexit and yes, I believe they had had enough. Well then, if the Queen wanted it, then I'd have probably followed her lead, because I love her so much. What I wouldn't give to see her. My mother was suspicious of the machines, but I was up there nevertheless. As for Brexit, I read over 100,000 have signed a petition on Parliament's web site for reconsideration, crashing the site at one point. I think a bunch of xenophobic chauvinists have thoughtlessly scuppered the future of their millennials. I must say that I DON'T consider 52% of the British people to be "xenophobic chauvinists" And rather than scuttling their children's future they are paving the way to provide sovereignty and self-determination for the next generation. I think that is a good thing. They want a positive future for their children, unfettered by mass EU regulation and legislation. Britain will be free again. Gosh, we never gave it a thought to jump right on the machines. Your mom was smart. It all sounds kind of like the US where it's divided about half and half. Think everyone is sick and tired of the powers that be and want change, but good Lord, that can't be Donald Trump. I remember one of my favorite essays, Alexander Pope's ESSAY ON MAN. It's the one that says "the end justifies the means," and "what is, is right." My favorite line though is, "we are all part of the chain, whereby one part is broken, the whole will fall," which makes one wonder. History does seem to often repeat itself. Just have to hope the thinkers will do the right things. I've never seen these machines, and not sure if they had them in England. Scary little things. I'm from the North West of England where the "leave" VOTE was the highest. I think many people are just sick and tired of the EU telling them what they can do and can't do in their own country. Another babe who I yet again am older than. Jo, that is kind of what I was thinking. Bailing out other countries like Greece as we are having to bail out Puerto Rico now and all the rules and regulations. The cash outflows just can't be sustained ad finitum, though I am not an economist. Perhaps GB was very brave and leading the way in making this decision. I hope so. Time will tell. I sure hope for the best. Mea culpa Jo - I meant ad infinitum. I shouldn't use Latin when I never studied it. Donna, I do remember those machines, but don't remember having my feet viewed by them on a regular basis. Maybe once, or twice? Cigarette smoking was also very popular with lots of parents during that era. Ha Frances, I think that about microwaves too, but I sure couldn't live without one. I do remember you saying, I think, you didn't own one. All adults smoked when I was young, or so it seemed. Not once do I remember having my feet-bones on display, right there in public. Maybe because our small-town little stores and Dress Shoppes didn't have the market for such a splendid appliance. Nope, no arcane doings for US, of the five-stores on Main Street, and the "shoe section" a wall in the back. My Buster Browns and little brown sandals were measured by that one cold foot-thing with the slidey sides (on my foot for a few minutes just this week, for the first time in perhaps forty years, when I mentioned I just grabbed last year's sandals from the Kids' Section) And sure enough---a Kids' Six. That's a bit down from what the family calls my little "shovel feet." Girl you DO BEAT ALL for finding weird wonderful bits of the past! Well Rachel, I've got what I call waffle stompers, so I think the machines caused it. Mom should have bound my feet. If you remember dear, I used to read encyclopedias for fun growing up. My husband says it's all useless information, and at times I wonder if my brain is full and that's why I can't remember things anymore. If you figure out how to download some of the info upstairs, let me know.